When in Miami beach and looking for a top notch backcountry charter, it's time for SeaCross. 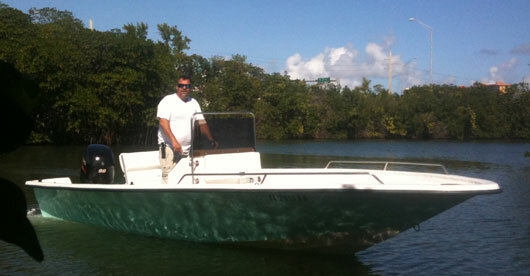 Aside from our big boats, we charter a 19 ft. Sundancer for the best flats and bay fishing Miami has to offer! Miami beach is known throughout Florida as one of the top sport fishing destinations and you can be sure that a Miami Beach backcountry fishing trip will satisfy even the most experienced angler! Miami Beach charter fishing has something to offer everyone, whether you're a seasoned angler or a very young angler and just learning for the first time. The fishing in Miami Beach is consistently plentiful for many different kinds of fish. This generous variety gives Miami Beach charter Captains here at Sea Cross Sport Fishing endless opportunities to get their fishermen hooked up! Sea Cross Sport Fishing charters offer some of the most exciting angling experiences in the world. So while Fishing in Miami or Miami Beach will provide opportunities at world class size and numbers of fish that few places in the world can rival.